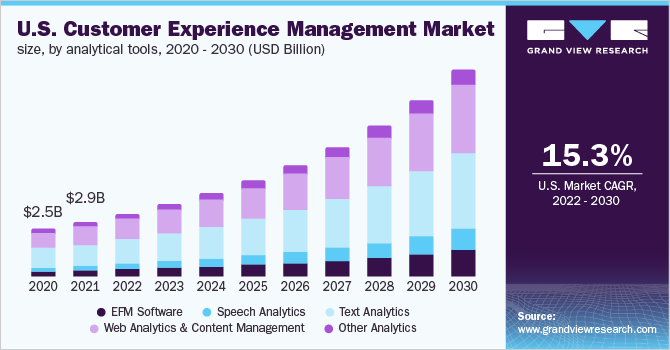 According to report published by Grand View Research,The global customer experience management market size is expected to reach USD 32.49 billion by 2025. Growing focus of business organizations on retaining their customers by providing consistent and enhanced customer experience across multiple channels is one of the key trends stimulating market growth. 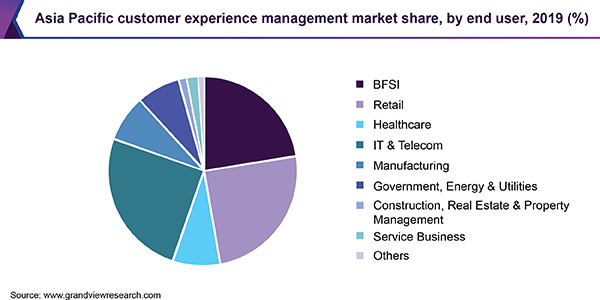 The global customer experience management market size is expected to reach USD 32.49 billion by 2025, according to a new report by Grand View Research, Inc., progressing at a CAGR of 22.9% during the forecast period. Growing focus of business organizations on retaining their customers by providing consistent and enhanced customer experience across multiple channels is one of the key trends stimulating market growth. Cloud-based implementation of customer experience management is expected to gain traction over the forecast period. This growth can be attributed to rising number of organizations using cloud deployment models at their contact center to effectively engage customers across different channels such as mobile, email, call center, social media, and chat. The retail sector is one of the largest end-users segment of customer experience management software. Retailers are actively focusing on delivering enhanced customer experience while buying and interacting with the brand or the company. In current era, customers are relying on different technology to get information and to make their purchase decision. Retail companies are using structured analytics CEM technology to maintain detailed information about their customer’s profile. By collecting this customer information from different touch points such as web, mobile, social and media, retail companies can get the idea about their customer preferences by analyzing their personalized insights. Using this crucial information, the retailers can deliver personalized and superior customer experience in turn gain loyal customer relationship. On the basis of touch point, the call center segment was the largest segment in 2016 and is anticipated to generate revenue of over USD 1.70 billion by 2025. Key players include IBM Corporation; Oracle Corporation; Adobe Systems Incorporated; Nokia Networks; and Avaya, Inc. dominated the market in 2016.